Jennifer Dickson is the chief planning and development specialist in Herrick's Land Use & Zoning Group, where she works with clients on all aspects of zoning and land use regulations. She has extensive experience with zoning and planning issues, and has worked on numerous complex rezoning, special permit and variance applications. She also helps clients navigate inclusionary housing regulations, landmarks issues and development rights transfers. Jennifer is also a leading authority on the Affordable New York housing program and its predecessor program 421-a. She has helped numerous high-profile developers, investors and lenders navigate the 421-a program, and assists clients with Affordable New York eligibility analysis, applications and compliance issues. She frequently lectures on the legislative and administrative aspects of both programs, including a Herrick seminar with former New York State Assembly Housing Committee chair Keith Wright, and a recent seminar with REBNY Senior Vice President, Michael Slattery. Additionally, Jennifer regularly appears before the New York City Planning Commission, the New York City Council and the New York City Board of Standards and Appeals. Additionally, she handles applications to the New York City Departments of Finance, Buildings, as well as Housing, Preservation and Development. 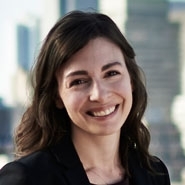 Prior to joining Herrick, Jennifer worked for the New York City Department of City Planning in the Transportation Division on pedestrian and bicycle planning projects.